German astronaut Alexander Gerst has compressed a six-hour flight, he witnessed from the ISS window, into a mesmerizing time-lapse sequence, capturing the Soyuz journey from blastoff at Baikonur all the way to its docking. The astronaut shot the spacecraft’s trip from the International Space Station’s ‘Cupola’ observatory module. 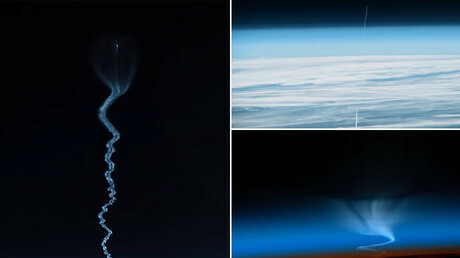 The video shows the Soyuz passing different layers of the Earth’s atmosphere. It is seen leaving a smooth contrail, which turns from white to blue right as the ship becomes a shiny dot surrounded by complete darkness. “I still can’t comprehend that there are humans riding on the top of this lone white streak into the great black open,” astonished Gerst wrote on Twitter. The Soyuz MS-11 was launched on Monday from the Baikonur Cosmodrome in Kazakhstan. It carried NASA’s Anne McClain, Canadian astronaut David Saint-Jacques and the ship’s commander, cosmonaut Oleg Kononenko into orbit. It was the first successful manned Soyuz flight since the botched launch on October 11, when cosmonaut Aleksey Ovchinin and rookie astronaut Nick Hague escaped certain death during a carrier missile malfunction.